All roads on Friday 27th February 2012 lead to Kitwe’s Moba Hotel and Convention Centre as ZCSMBA through its Copperbelt provincial representation held a unique gathering bringing MSMEs and Chief Executive Officers of the various mining conglomerates in Zambia together. Dubbed Talk of the Millennium Gala Nite, Copperbelt Province Permanent Secretary Mr. Christopher Muntembo speaking as Guest of Honour applauded the efforts of the MSME body for such a bold way of trying to foster business linkages between the large companies whom he described as not having backward links necessary to ensure that the wealth of the country trickled down to the enterprising indigenous masses. He observed that the situation was so as there was no real relationship between the large scale industries and the common man on the street eking out a living through entrepreneurship. Large scale companies he said “do not have backward links which can facilitate trickling down of economic benefits. There is therefore a gap, a disjoint between the operations of large companies and the activities of ordinary citizens”. This was exactly the rationale behind ZCSMBA organising such an event; Part of our mandate is to ensure that we explore viable areas that can facilitate growth for our MSMEs. 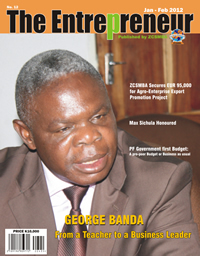 Seeing that there have been a lot of complaints from entrepreneurs regarding the operations of the mines in terms of contract awarding etc, and the fact that there is little benefit for Zambians from the country’s mineral exploits, ZCSMBA thought it wise to organise an up close and personal with the concerned parties. The event attracted scores of mainly Copperbelt based MSMEs who were eager to engage with the mine bosses or their representatives with the hope of getting a little firsthand information and maybe clinch a business deal or two. The success of the gala hinged on this and not how well attended it was as Mr. Muntembo rightly stated in his remarks. He hoped, as do ZCSMBA that the success of the gala will compel or encourage others especially the mining companies to open up more in support of initiatives meant to improve inter-business relations and in general, the business climate in Zambia. The Guest of Honour further expressed concern at the still comparatively high interest rates inhibiting the growth of MSMEs and assured the raptly attentive participants that Government was working towards addressing this. The PS’s remarks over the PF Governments plans to increase its stake in every mining company to at least 35% drew quite a cheer. This he said would ensure that Zambians finally started benefitting from their country’s mineral wealth. Speaking in his opening remarks, ZCSMBA Board Chairperson George Banda appealed to the mining companies to help MSMEs by channelling some of their corporate social responsibilities through the district business associations. This he said would ensure that even the grassroots benefitted from the high copper prices as the DBA’s were ideal channels - conduits without which even the Government would find it difficult to implement programmes especially at rural level. Some of the CEO’s present included Barrick Lumwana’s Randy Huffington who gave quite a captivating presentation on some of the opportunities that MSME’s could take advantage of and his company’s identified possible areas of cooperation with MSME’s. Mopani represented by the company’s public relations personnel, equally highlighted the mining giant’s involvement in contributing towards uplifting the living standards of the people in their areas of operation through various CSR initiatives. Other conglomerates represented included EC Mining, Kagem and Atlas Corpco. ZCSMBA is grateful to the above companies and to Perway Zambia Industries for making it possible to hold this event through their financial contributions.